Next: Next post: Latest review of Love Train: 5 stars! Julie Hawkins has found creative freedom as an indie, and focuses her writing on Civil War fiction. She talks about the techniques she used to tap into a specific market. In the spring of 1861, a country once united is fractured by war. In north Alabama, Hiram Summers, a farmer and father of three, enlists to protect his inherited property. His son, David, also desires to go, but is instead obligated to stay behind to care for the farm. Hiram travels to Virginia with the Fourth Alabama Infantry Regiment, where he is quickly and inevitably thrust into combat. In the meantime, David searches for adventure at home by traipsing to Huntsville with his best friend, Jake Kimball, to investigate rumors of invading Yankees. Their escapade turns into harsh reality when they discover the true meaning of war, and after two years of service, Hiram sees enough tragedy to last a lifetime. A Beautiful Glittering Lie addresses the naivety of a young country torn by irreparable conflict, a father who feels he must defend his home, and a young man who longs for adventure, regardless of the perilous cost. I am just starting out in the book publishing industry, but I would eventually like to be published by a traditional publisher. Indie publishing is a good way to springboard my work into that industry. 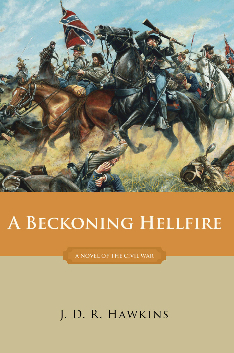 Since I published my first book, A Beckoning Hellfire, independent publishing has changed dramatically, so that now authors can have bestsellers without being picked up by traditional publishers. Working independently gives me the freedom to express my views without conforming to the traditional market. It has more flexibility and opportunity than ever before. Traditional publishers are looking for bestselling authors with an accomplished track record. What I have found by attending conventions is that there are a lot of independent writers who are equally talented. Being published independently doesn’t reflect the quality of writers who are out there. My experience with self-publishing so far has been very good. It has given me a vehicle in which to publish a story that I feel passionately about. It has also enabled me to establish a following of readers who have an ongoing interest and relationship in the Civil War market. The most effective marketing techniques I have used were the ones where the reader was able to see the product, such as at book signings, reenactments, and speaking engagements. Civil War enthusiasts are impressed by the battle scene quality on the front cover of my book, and by the intriguing copy on the back cover. My book has also appeared in local media and in national publications. I intentionally avoided using expensive advertising in large newspapers and radio because I did not have the budget to afford those markets. In my experience, the smaller, local markets were just as effective, since it was my first novel, and I had yet to establish myself. Self-publishing is very powerful. When I started out, I just wanted to get my book out there. Now the market has grown so much that the possibility of becoming a bestselling author is a reality. The one thing I would do differently would be to have a strong marketing plan and begin marketing before the book is even published. My advice for other indie authors is to keep writing. Don’t get discouraged or burned out, because it is an ongoing process. Eventually, you will be discovered. Currently, I am working on several books. My new novel, A Beautiful Glittering Lie, is slated for publication this spring. It is the prequel to A Beckoning Hellfire, and the two books are part of a four-book series. I am also working on a nonfiction book about the Civil War, as well as two other novels, one of which is set in my hometown, Sioux City, Iowa. My personal brand of books thus far has been to tell the true story of the Confederate cause. Growing up in Iowa, I never understood why so many Southern men would fight to preserve slavery. Now I know that was not the case. Readers can learn more about my books at my website: abeckoninghellfire.com.